Climate Interactive is a small team with big goals. One of our founding goals was to offer rapid turnaround analysis of the most important climate and energy issues, and to make that analysis available ‘open source’. In doing so, we reasoned, we’d be boosting the effectiveness of the many, many parties –- from negotiators to civil society leaders — who are calling for climate policy ambitious enough to be consistent with the latest science. And, if such groups found our analysis helpful and clarifying, we assumed they would share it with their networks and constituencies, reaching more people than our small team ever would on its own. Over the years, from Copenhagen to Cancun, this has been a productive formula for us, and it paid off again in Durban, where we analyzed the impact of waiting until 2020 to increase the ambition of pledges. 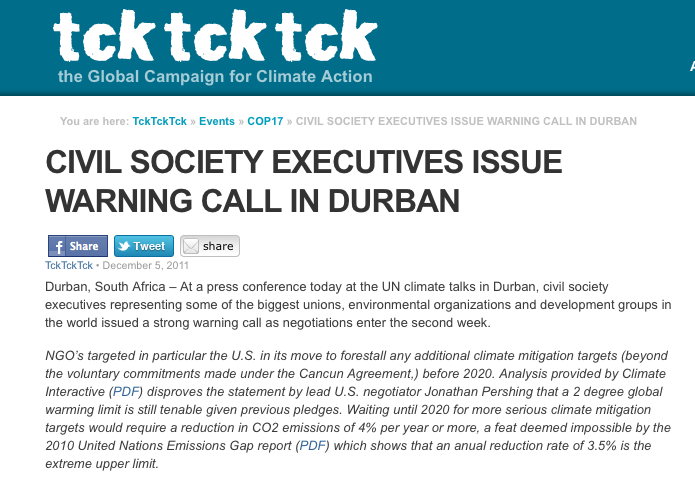 Our analysis was shared within the TckTckTck network (a global alliance of more than 300 civil society groups). It also was included in a joint press release from Greenpeace and WWF. While celebrating our role in these remarkable events, we also soberly acknowledge that, in the end, Durban did not increase the ambition of 2020 pledges to be in line with a feasible 2°C pathway. Our efforts helped the world to see, without any illusion, what was being decided, but we didn’t get a better deal. So, we’ll be keeping at it, in 2012 and beyond. We’ll be ‘adding up’ current pledges, and we’ll be offering analysis of the ‘how-to’ of the transition to a low carbon economy, which is, after all, the fundamental re-orientation needed to deliver a liveable climate. As long as there are leaders out there calling for policy that matches the science, we’ll be doing what we can to offer analysis that helps them make their case. Excellent post – TRANSPARENCY the ultimate tool to get change moving, and that is first in our heads, seeing the reality!! !